This IBM Redbooks publication is designed to help you understand and implement the S/390 Cryptographic PCICC card. 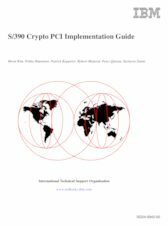 Although this book is focused on the enablement of the S/390 PCICC product, cryptography and the available services on S/390 are also discussed and explained, with special attention given to the new Trusted Key Entry (TKE) workstation. Reader familiarity with the previous S/390 cryptography-related book: Exploiting S/390 Hardware Cryptography with TKE, SG24-5455, is assumed.